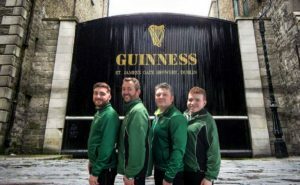 Ireland’s men ran the Belgian’s out of stones in the last end to record their third victory in the C Division in Romania. A steal of four in the second end set up the win and the team kept their noses in front all game. Ireland are second in the table behind France at the moment. They face Slovenia later today. A score of three in the fifth and four in the tenth saw Ireland record their second win against Greece in the Euro C Division in Romania. Well done to our men, keep it up against Belgium and Slovenia tomorrow! A magnificent three from the Irish women saw them pip France in the last end to record their first win at the European C Division in Brasov, Romania. The momentum in the game swung from one team to the other over a tense ten ends, but the Ireland team made the last stone count going down the last end. Well done to all the team. Next game for the women will be against Croatia in the morning. Ireland’s men suffered from a slow start losing a single and a three before getting a two back. But they were always on the back foot and Romania kept their advantage. The men now face Greece this evening. A loss of six in the ninth end scuppered the Irish women’s team chances of getting a win in their first game in the European C Division against Belarus in Brasov, Romania. Alison, Jen, Jacqui and Katie play France this afternoon. France also lost their first game. Steals of two in the fifth and eighth end set Ireland up for a comfortable victory in their first game in the C Division today in Romania. It’s the women’s turn tomorrow morning against Belarus and the men return to the ice tomorrow afternoon when they face the host Romania. Steve and his biggest fan – daughter Elspeth. 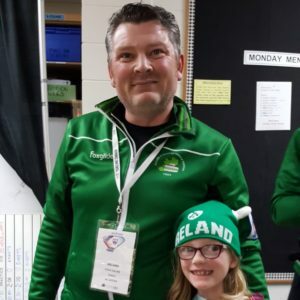 Making his debut as an Irish international player at the Le Gruyeré AOP European Curling Championships 2019 C Division is Steve Callan, who will play second in the men’s team. So, as is the tradition at ICA headquarters, Steve has been asked to reveal a wee bit more about himself, ahead of taking to the ice with the shamrock on his back, in a player profile. Occupation – Town Planner- making peoples dreams come true with my planning decisions!!! Status – single / married / divorced / still wondering? – Married to Ailie for 11 years. She gets a lot of sympathy for time served. Favourite sport outside curling: To play – Still play a wee bit of hockey at my age. That’s field hockey, KT Kerr and any other North Americans who see this! Who would you really like to meet? – Tommy Tiernan – Irish comedian and a bit crude but great craic!! Favourite TV programme? – Police dramas like Line of Duty and Luther and has to be Still Game for light relief. Favourite holiday destination and why? – It was Melbourne, until my trip to Canada as Coach to Irish Mixed team last October. Now its British Columbia and Vancouver in particular. Beautiful country, lovely people and very fond of their curling. Favourite other Irish curler and why? – Have no favourites, I love them all especially James , Arran, and Eoin!!! You can save one prized possession. What is it? – Slightly embarrassing but I still have a blanket from when I was a baby under my pillow. Who would you choose to be marooned on a desert island with? – Marina Russell – James mammy. All my meals made for me, clean clothes and a spotless abode. What more does one need, plus better banter than her son!! Sum yourself up in five words – Shy and retiring Cork boy!!! Good luck to Alison. Jen, Jacqui and Katie and coach Johnjo from all ICA members. 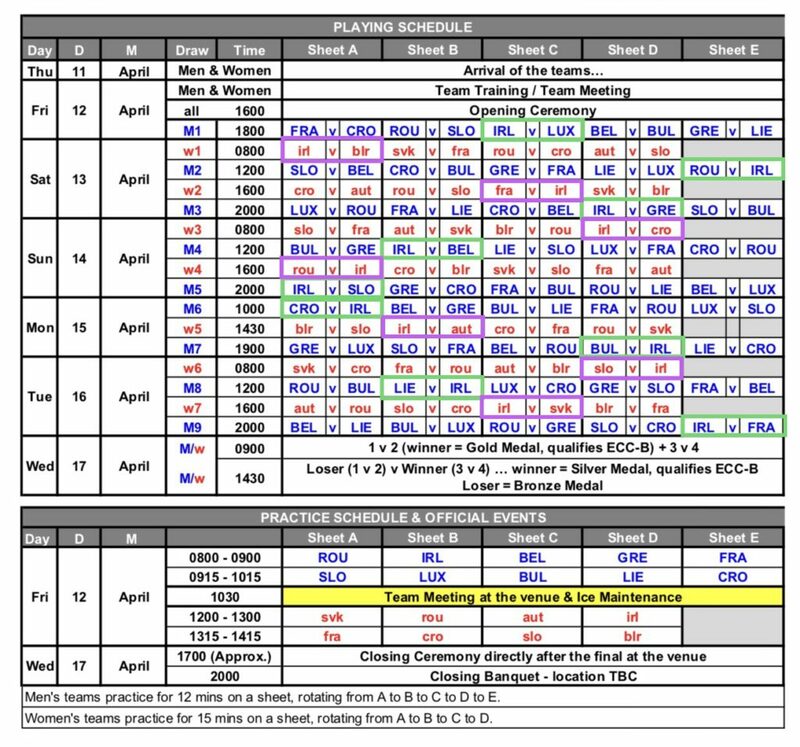 There’s still more curling to do before Irish players can hang up their kippers for the summer, beginning with the European C Division qualifier in Brasov, Romania on 12-17 April. 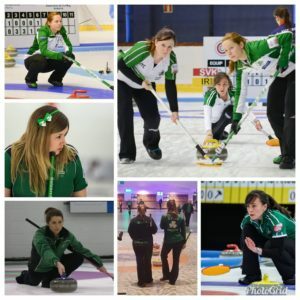 Ireland will be represented by James Russell, Arran Cameron, Steve Callan and Eoin McCrossan in the men’s competition and Alison Fyfe, Jen Ward, Jacqui Barr and Katie Kerr in the women’s. The respective coaches are Martin Sutherland and Johnjo Kenny. Before leaving, skip James was hopeful of leading Ireland up to the European B Division. “It’s that time of year again, final preparations are underway for C-League in Romania. It’s nice to be back playing Europeans after taking last year off to finish University (I know, I’m more surprised than anyone). This year the team is a four- man squad consisting of myself, Arran Cameron, (debutant) Steve Callan, and long time fifth man Eoin McCrossan. Having spent the first half of the season abroad it’s been pretty all go for us since January, but the intensity has paid off and it feels like things are starting to come together and we are hitting a nice rhythm together. We all know our roles in the team, on and off the ice so I am confident that the lads can do the business and let me play guards all week.